The unusual timing of highly productive summer plankton blooms off Greenland indicates a connection between increasing amounts of meltwater and nutrients in these coastal waters. In a new study published today in the international journal Nature Communications, an international group of researchers led by the GEOMAR Helmholtz Centre for Ocean Research Kiel shows that this connection exists, but is much more complex than widely supposed. Whether increasing meltwater has a positive or negative effect on summertime phytoplankton depends on the depth at which a glacier sits in the ocean. Observational data clearly shows that Greenland's mighty ice sheet is, slowly but surely, losing the race with rising global temperatures. Each summer, Greenland's glaciers transport more ice and meltwater to the ocean. There, among other things, the meltwater contributes to global sea-level rise. But does it also change the chemistry and biology of the oceans? According to a common theory, nutrients in the meltwater trigger plankton blooms off Greenland during the summer months. "The timing of these summer blooms is actually unusual for plankton, so the connection with the meltwater seems obvious," says Dr. Mark Hopwood, chemical oceanographer at the GEOMAR Helmholtz Centre for Ocean Research Kiel. However, Hopwood and colleagues from GEOMAR, as well as from the U.S., the Netherlands and Greenland, have found that this connection is more complex than previously thought. "Our samples and data show unambiguously that a retreat of glaciers inland will lead to a decrease in the extent of summer plankton blooms," says Dr. Hopwood. The team has published its results today in the international journal Nature Communications. It was already clear that more factors than simply the amount of meltwater affect plankton blooms. "The main nutrient that plankton lack around Greenland is nitrate, while glacier meltwater contains mostly iron and silicon," explains Dr. Hopwood. The fact that the meltwater can cause plankton blooms is due to the way glaciers release meltwater below sea-level at the coastline. The outermost tongues of over 200 of Greenland's glaciers directly end in the sea and extend to depths of several hundred meters below the surface. Meltwater, which flows below the glaciers into the sea, is less dense than the seawater and therefore rises, often violently, to the surface. This upwelling process transports nitrate-rich deep seawater to the upper layers of the ocean and thus triggers plankton blooms in the light-flooded surface layers. "In our study, we have calculated this relationship between meltwater discharge and the resulting nutrient change from deep seawater quantitatively for the first time," says Dr. Hopwood. 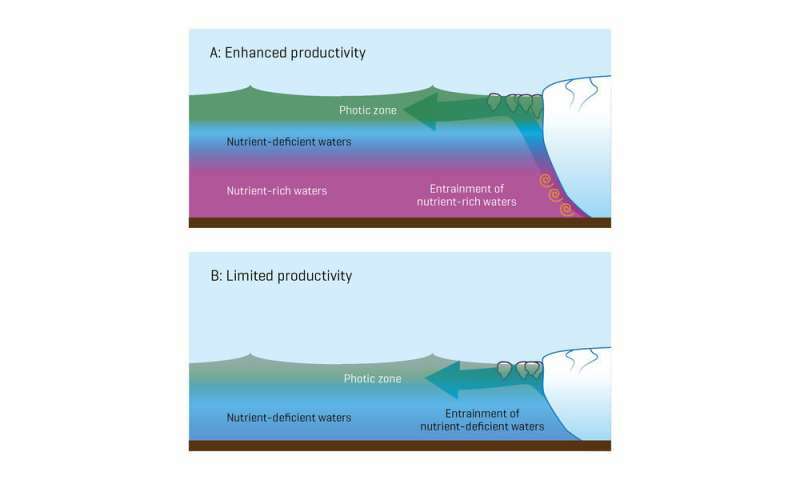 The result: The deep seawater contributes over 90 percent of the nutrients that fertilize the surface layers, the actual meltwater only about 10 percent. Based on this result, the team has further calculated what happens when the affected glaciers continue to melt and retreat inland. "The fertilizing effect of the upwelling works only for a certain depth range of the glaciers terminating in the sea. This depth is likely to vary regionally, but is generally between about 700 and 500 meters," says the lead author Mark Hopwood. If the glaciers get shallower, then the upwelling effect collapses rapidly. In simple terms, this means that the relationship between meltwater volume and ocean fertilization is complex. It depends very strongly on the location of the glacial terminus. "So the study shows that further melting of Greenland's glaciers only leads to stronger summer plankton blooms under very specific conditions, an effect that will ultimately end with very extensive further melting," Hopwood summarizes the results of the study.